Note: A few years ago I wrote a detailed post about how I cook Kosher for Passover, or K for P as I call it. Another easy and yet sophisticated-looking dish for Passover. Start by roasting the beets whole (in the over for about an hour, or until tender). While warm, peel the beets and cut them into chunks. Splash on some vinegar, salt & pepper, and then stash them in the fridge so they get cold. When you’re almost ready to eat, boil a couple of eggs (I use Julia Child’s “perfect boiled egg” method) and strip the raw kale leaves off of the stems. Make a vinaigrette with the same vinegar you used on the beets, some lemon juice, salt, pepper, and oil. 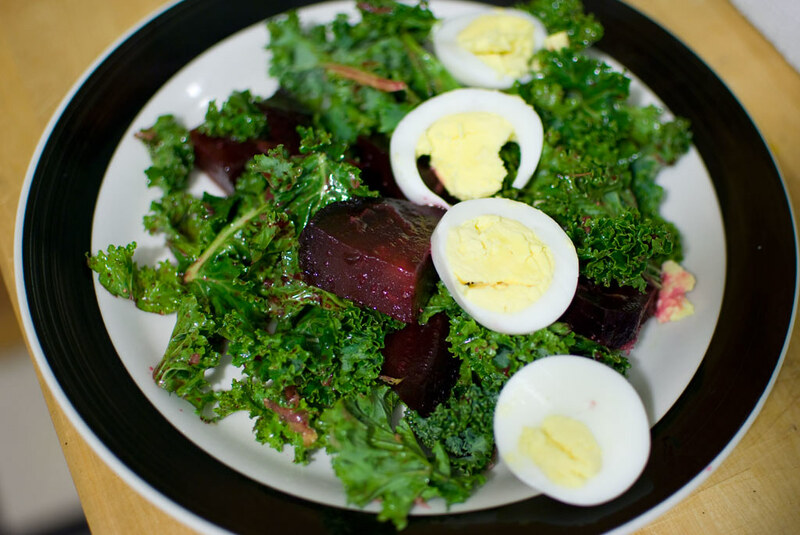 Toss the beets and and kale with the vinaigrette, and top with a sliced boiled egg.